Color is necessary for any paper craft. Even if you prefer monochromatic art, you must fill in the craft with shades of black, white, and gray. Learning how to pick colors and arrange them together is a necessary skill to create beautiful cards, layouts, and any other paper crafts. If you are a fan of rubber stamping (and most paper crafters are!) 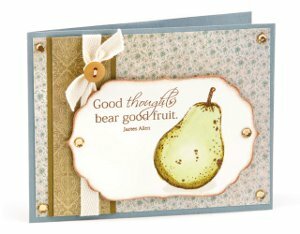 you must learn how to fill in your stamped images with color. While using a flat stamp with an inkpad is a valid option for your rubber stamping crafts, there are so many other possibilities for coloring in your stamped images. 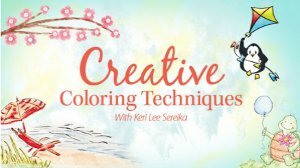 Sharpen your coloring skills with an array of supplies with the Creative Coloring Techniques Online Class from Annie's Crafts. Creative coloring techniques expert Keri Lee Sereika teaches paper crafters how to use a variety of coloring tools to color in her stamped images. She begins with colored pencils, then moves on to alcohol markers, an airbrush system, watercolors, watercolor pencils, and finally chalks and pigmented powders. Each medium involves unique techniques and serves a different purpose, but they each all have things in common. For example, it is always easier to add color than to take it away. This important tip is emphasized throughout the two hour class. There are endless tips and techniques you will learn from taking this incredible class. Annie's Catalog online classes are available to you forever once you have purchased them; they do not expire. You can watch the videos over and over to sharpen your understanding of any given technique. These classes are more desirable than a standard class because you can watch them as many times as you'd like. If you attend a class in person, you may ask the instructor questions; however, it isn't ideal to slow down the class by asking the teacher to repeat what they have just done. Additionally, there are so many techniques explained in this class in particular that you likely will not practice them all at once, and it would certainly be a challenge to remember every detail. This class is really like viewing five classes in one, and you can reference the video whenever you'd like. Learn how to color like an expert and take your paper projects to an entirely new level with this fantastic coloring class.